Is Your Baby Ready To Try Juice? Is your baby becoming more and more interested in your plate when you eat and your cup when you drink? Are you wanting to start introducing flavors, but not sure exactly what to try first, or even when to try? I’ve often thought that parenting would be so much easier if positive pregnancy tests came with complimentary user’s manuals. Something that tells us what to give, when to give it, and when to worry. But unfortunately for all of us, that is not the case. Lucky for you we’ve been there, done that, and if we don’t know the answer, we do the research, so you don’t have to. In this article, we are going to address the sometimes sticky topic of introducing juice to your baby. We’ll talk about when it’s safe to introduce juice, go over how to introduce it, and discuss what to avoid when introducing it to your baby. When Can a Baby Have Juice? Up until the age of six months, your baby’s diet should consist of only breastmilk or formula. So, if your baby is younger than six months old, they are too young for juice, or water, or solid foods for that matter. While the recommendations used to allow for juice after the age of six months, it has recently been changed to a new recommendation — 12 months. There are many reasons for this, including the fact that breastmilk and formula provide a baby with all of the vitamins and nutrients it needs, your baby’s digestive system needs time to mature, and baby will have a lower obesity risk (source). Babies who are exclusively breastfed will also have a higher immunity. On top of waiting six months to a year to introduce juice, you should also make sure your child is already eating solid foods (source). If you introduce juice before your baby is getting vitamins and nutrients from solid foods, you risk them getting full from the juice and refusing formula and breastmilk. Remember, liquids like water and juice can fill a baby up without giving them any of the vital nutrients they need to grow and develop. If they do not get the nutrition they need, the risk of malnutrition, failure to thrive, and anemia goes up. They all can cause serious problems to your baby’s health and development. So, your baby is old enough to have juice. You’ve started on solids and are confident your baby is getting enough vitamins and nutrients even if you introduce juice throughout the day. Great, we’re so excited for you! But before you toss some orange juice in a cup and have at it, make sure to read through the following points to prepare yourself. Trust us, your sanity and your baby’s tummy will thank you. Although six months is generally the recommended age for introducing juice, some doctors recommend waiting until 12 months. It’s always a good idea to check in and see what your doctor thinks to make a fully informed decision. They might know something about your family’s history, or your baby’s medical history, that could make them want you to hold off a bit longer. Just as you try one new food at a time, you should also try one juice at a time as well. Start with single vegetable or fruit juices and work your way up to combinations. It used to be said you should wait two to three days between introducing each new food, but it’s now no longer said to be necessary (source). Though the wait is no longer necessary, introducing one item at a time will make recognizing adverse reactions easier for you. Grapes and grape juice are two very different things. The same goes for tomatoes and tomato juice. Ask anyone who has ever opened up a can of V8. Because of this, you should treat them as separates when introducing them to your baby. For example, you can try grapes out this morning, and try some grape juice out tomorrow. This is just an extra measure to make sure you can identify any allergies baby might develop. Juice can fill baby up and make them less likely to eat the things that will provide them with the nutrients they need. By offering it only at meals, they are less likely to chug it down and get full off of the juice alone. And they are getting the needed vitamins and nutrients from the food on their plates. Liquid from bottles will sit on your baby’s teeth longer than if it was taken from a sippy cup (source). That is why it’s not recommended to put your child to bed with a bottle because the sugars in the liquid sitting on their teeth are likely to cause tooth decay. If you are going to give your baby anything in a bottle, make sure it is not juice. The acid from juice is even worse than the sugar in milk, breaking down the enamel and causing decay faster than other liquids. It’s suggested that you only give your baby 2 to 4 ounces of juice each day (source). Too much juice can not only make your baby feel full, it can also lead to obesity and short stature in children, and has been linked to failure to thrive (source). Juice should add complementary flavor to your child’s diet, and not be treated as a substitute for the things they really need. Diluting juice is important both because of its sugar content, as well as its acidity. To help prevent tooth decay and tummy issues, it is recommended juice be diluted to a 50/50 ratio with water. Homemade is always best for baby, right? I mean, it’s packed full of vitamins and nutrients after all. Hold your horses; it’s a little more complicated than that. While juice made from raw fruits and vegetables does provide vitamins and nutrients to those who drink it, it should not be allowed to touch your baby’s lips. Why, you ask? Because along with the vitamins and nutrients that come with raw produce, quite a few bacteria come with it too. Unless juice is pasteurized properly, something that is hard to do at home, it can be dangerous to your baby. Pasteurization is the process of killing bacteria by heating it up to a certain temperature for a certain amount of time. Unpasteurized juice can contain higher numbers of bacteria such as E. coli, cryptosporidium, salmonella, and norovirus (source). While older children and adults can usually handle the bacteria that lies in raw fruit juices, your baby’s small tummy will have a harder time. Any or all of these symptoms can be harmful to your baby. In severe cases, these bacteria can cause acute kidney failure, seizures, and even death (source). Instead of making juice for your baby at home, where you cannot assure it is pasteurized properly, it’s best to head to the grocery store when choosing juice for your baby. Pick a juice that is 100 percent juice, with no extra sugar or additives. If you insist on making your baby’s juice at home, make it out of fruits and vegetables that have been either boiled or steamed before juicing them to kill off as much bacteria as possible (source). The same issues can occur when feeding your baby raw vegetables, and especially fruits, which is why many doctors recommend cooking all fruits until your baby is 8 months old. We hope your baby’s tummy enjoys the flavors of juice without any troubles, but sometimes things can happen. Juice can make baby feel full, without actually giving them the nutrients they need to grow and thrive. If juice makes your baby feel full, they can start to refuse the breast milk, formula, and food they need to grow and thrive. If the juice is not diluted correctly, the excess sugar can be tough on baby’s tummy. One of the symptoms of juice that is too strong is diarrhea. While making your baby go poop can be a good thing in some cases, like when doctors recommend prune or pear juice if a baby is constipated, diarrhea could ultimately lead to dehydration. We mentioned earlier in this post that fruit juice contains a lot of acids and it also contains a lot of sugar. Both of these things can be bad for baby’s teeth. Even if you make sure to give your baby their juice in a cup, it can still sit on their teeth and lead to tooth decay. If left untreated this can be painful and take extensive treatments to fix, including pulling out your baby’s teeth (source). Juice drinks are not juice (source). 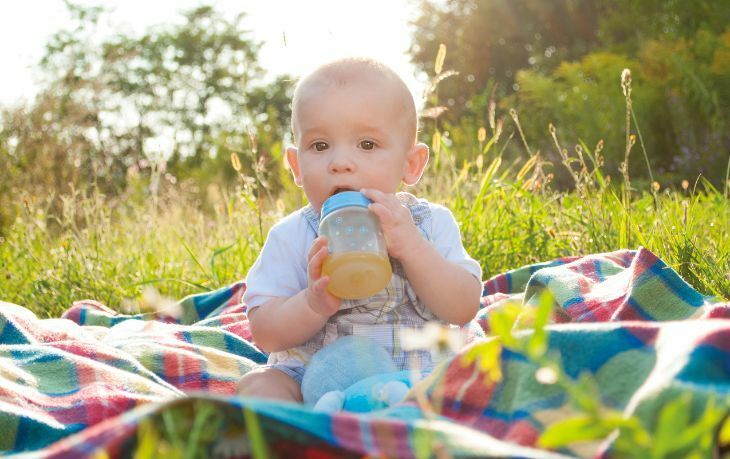 While they might be sold in the same aisle, and they might look the same in the bottle, juice drinks can be comprised of as little as 10 percent juice, meaning they have even fewer benefits for your baby. Babies have an immature digestive tract that makes it harder for them to break down sugars. Undiluted fruit juice, or juices that contain high fructose corn syrup, might cause your baby to experience gas and stomach pains when they try to break down the sugars. Any of these problems can cause pain and discomfort for your baby. If your baby starts to experience any of these symptoms, it might be a good idea to hold off on the juice for a while and give your baby’s tummy time to settle down. If you don’t take this step, the problems can continue to get worse and possibly lead to anemia, malnutrition, failure to thrive, and obesity. Each new milestone your baby hits is an exciting new experience for both you and them. Whether it’s their first time rolling over, their first steps, or their first taste of juice, each new thing is an adventure you are embarking on together. Juice can be a great way to introduce your child to new flavors, but it doesn’t come without its risks. Treat it like other foods. Remember foods and juices are two separate things. Offer juice only during meals. Give juice in a cup, and not a bottle. Limit the amount to 2 to 4 ounces. Don’t forget to dilute it with water. Do you have a story to tell about introducing juice to your baby? Share it with us in the comments below. And don’t forget to share this article with a new mama in your life to help make sure she has the information she needs when introducing juice to her little one.